For a perfect masculine look bathroom style make sure to choose dark and vivid colors. Colors like black and grey in its darkest shades would be most suited. 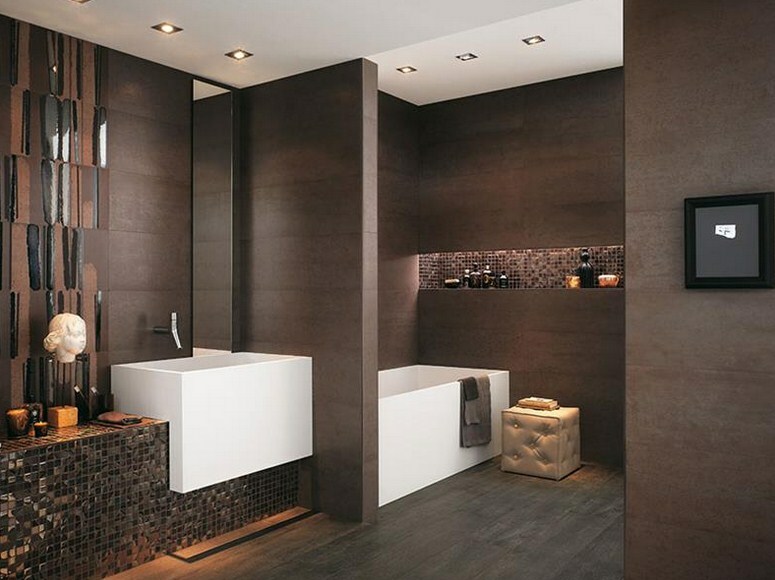 These dark and gloomy shades highlights the masculine feel in the bathroom. So choose musky shaded tiles, marble, or concrete for your bathroom. 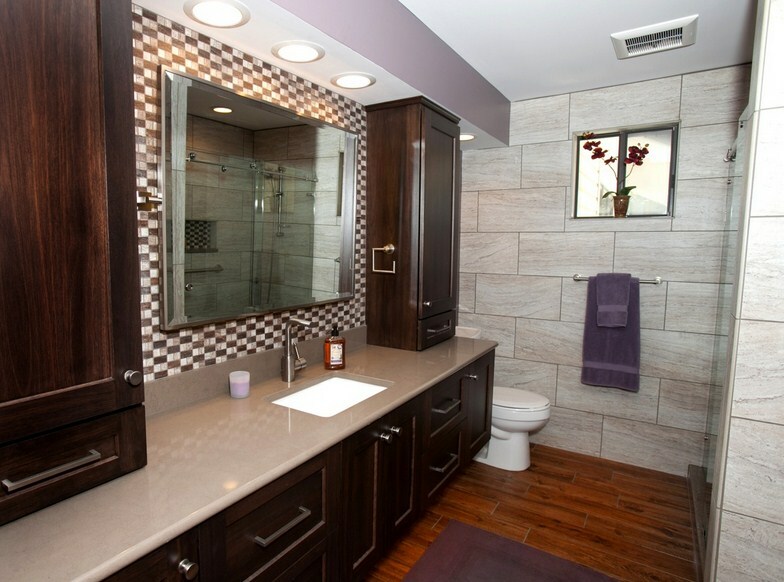 Materials that presents strength, power, and ruggedness are the best choice for a masculine design bathroom. Therefore and stone and marble create an elegant, extremely classy, and sophisticated look to your bathroom. 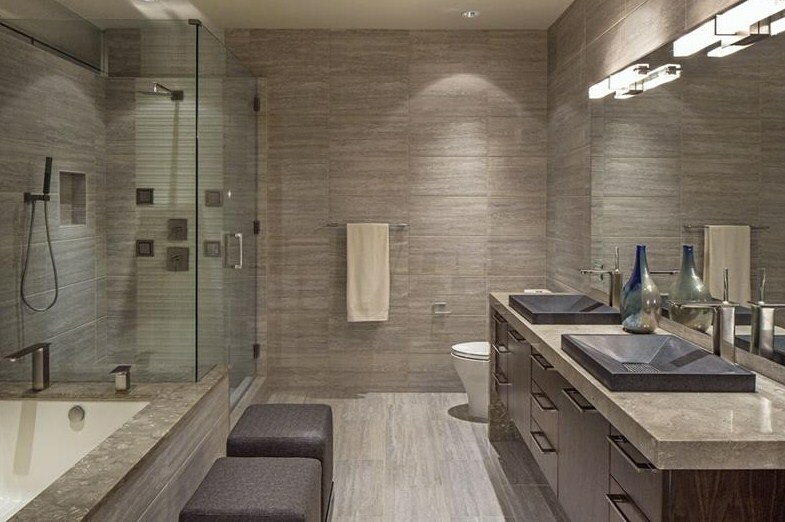 To add texture and volume to your bathroom, choose stone walls, more specifically concrete walls because they have an amazing trait of changing their color when water is being splashed on it. As in the list of dark colors we added grey and concrete is of a beautiful grey shade, hence use concrete walls to enhance the exotic beauty of your bathrooms. 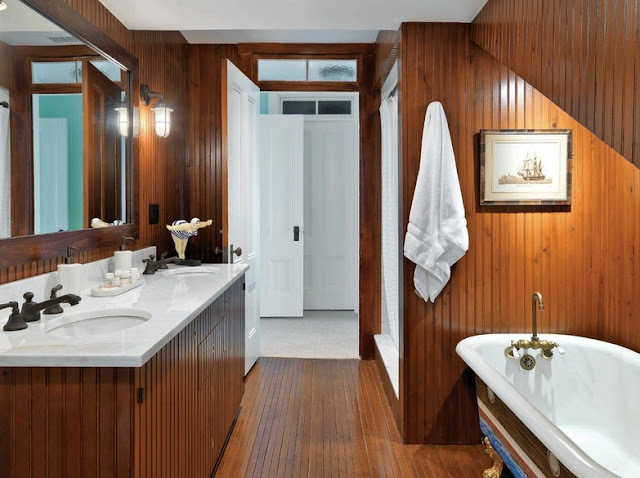 Wood texture is a total yes of designing masculine look inspired bathrooms because they create a warm aesthetic that is soothing and calming. Wood is the best choice to create a sharp and rocky environment and along with that it helps to create mature and refined interior that describes masculinity. Alongside with concrete walls, use of wooden textured cabinets and vanities would imply a wondrous and splendid look of your bathroom. Instead of curtains for making fully closed showers use of glass is the best idea. Glass is most popular and stylish way adopted in modern bathrooms as it creates a clean and minimalist sort of environment. Curtains give a traditional feminine look whereas glass shows stiffness and roughness for a complete masculine look of the bathroom. Firmly attached glass for fully enclosed showers fashions and maintains an expression of solidarity and durability. 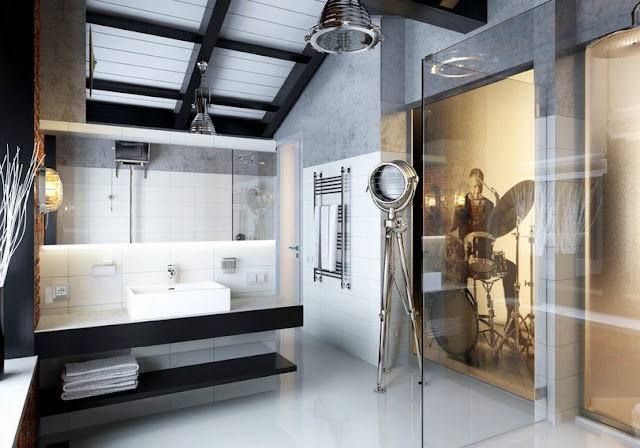 Adding historical touch to your bathroom designs is not only a unique way to highlight masculinity but is also highly elegant. Masculinity is all about realism, a perspective that believes in man power for wars and victory. Our history includes several wars and great personalities which are true representative of strength, relentless hard work, and courage. Therefore adding accessories such as portraits, paintings, or frames or stills of a specific moment or time of war in black and white would be super classy. Another way is add antique pieces to the display of your bathroom shelves that helps and aids to create an exotic sense of historical awareness.